A medieval parish church, dating mainly from the 15th century, with 19th century alterations. The church has an Early English piscina and south doorway and early brass memorials. These include one to Sir Nicholas Dagworth who owned the medieval house in the 14th century, and a series of memorials to the Boleyn family. Mainly a Perpendicular building, with Perpendicular arcades, windows. Tower added by Street 1876 and much 19th century reworking, including work by Butterfield and Watts. Important series of tombs 16th to 19th centuries, including Sir Nicholas Dagworth, who owned the Hall in the 14th century, and members of the Boleyn family. E. Rose (NAU) 5 February 1990. --- Aerial Photograph: TG1728 AK,AL,AN. --- Aerial Photograph: Edwards, D.A. (NLA). 1994. TG1728/ACG. --- Aerial Photograph: Edwards, D.A. (NLA). 1995. TG 1828M - N.
--- Aerial Photograph: Edwards, D.A. (NLA). 1996. TG 1828T - V.
--- Newspaper Article: 2001. Eastern Daily Press. 16 March. --- Article in serial: Airs, M. 1980. The Church of St Andrew, Blickling. Archaeological Journal. Vol 137 pp 341-342. <S1> Unpublished document: Mead, D.. St Andrews Church, Blickling..
<S2> Monograph: Pevsner, N & Wilson, W. 1999. 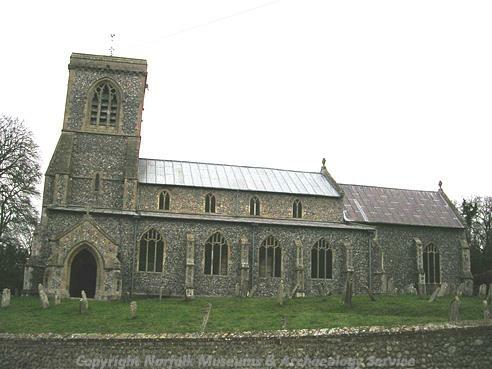 Norfolk 2: North-West and South (2nd Ediiton). The Buildings of England.